It was love at first sight! 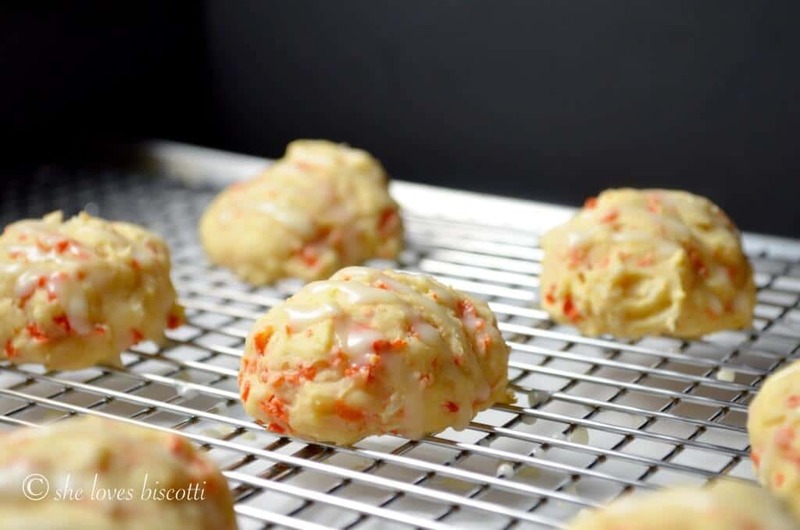 From the moment I saw these Glazed Yogurt Carrot Cookies, I knew they would be a hit with family and friends. 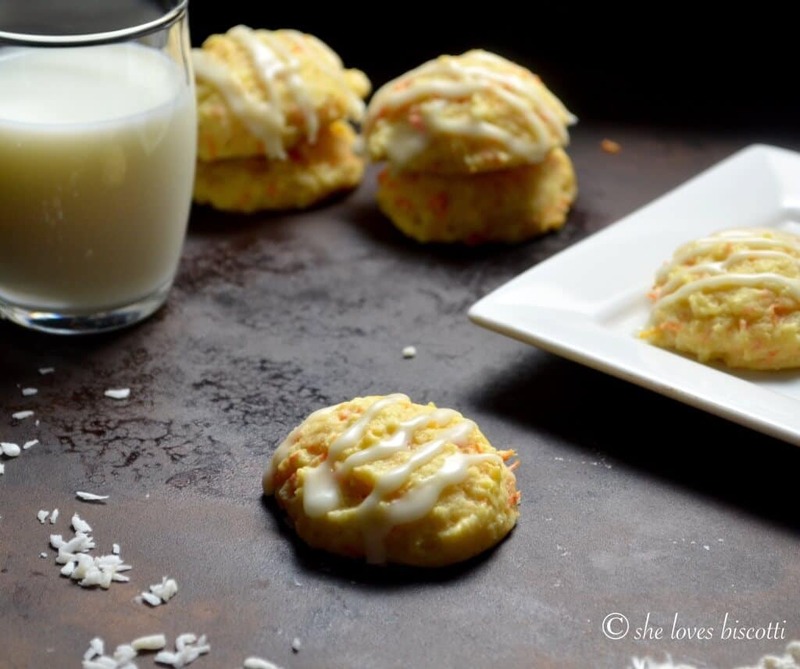 If you glance at the list of ingredients for these Glazed Yogurt Carrot Cookies, you will immediately notice the presence of coconut. The coconut contributes a little something tropical to this cookie. And after a winter that doesn’t seem to want to go away, tropical is good! You will also notice that the original recipe uses cooked carrots, but I wanted to know what a raw, grated carrot would taste like in this particular carrot cookie. So I tried both variations of the cookie. The taste didn’t change all that much, but the grated version did have a less smooth texture. Personally, I preferred the raw grated carrot cookie’s consistency, and besides, the raw carrot gives you more bang for your buck, nutritionally speaking. If you recall, I have already used the combination of carrots and coconut in this recipe for my refreshing creamy pineapple coleslaw. I kind of had a feeling that I would like the flavor combination here too, and I did. Nutrition Tip: You can always get away with making little changes to any recipe to suit your dietary needs and preferences. 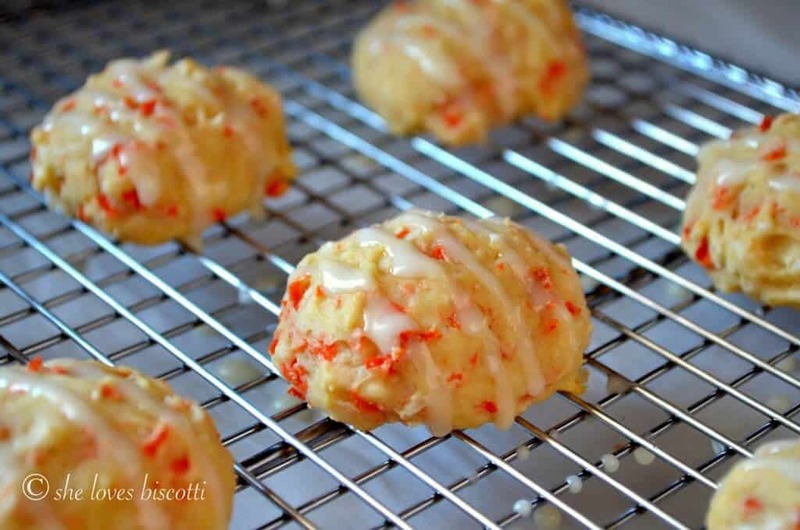 Take this carrot cookie recipe for example – the original recipe called for 3/4 cup of margarine. I replaced it with 1/3 cup of yogurt, 1/3 cup applesauce and only a 1/3 cup of butter, thereby reducing the total amount of fat. Recently, I was in my dentist’s waiting room, trying to make good use of my time by “surfing” the internet on my i-phone. I discovered a lovely site called Worth Whisking. This carrot cookie recipe especially intrigued me – I thought the combined flavors of orange, carrot and coconut sounded promising! So much so that I wanted to make them as soon as I got home. Thank you Stephanie for the inspiration! I made a couple of changes to the recipe: As was previously mentioned, I replaced some of the margarine with yogurt and applesauce; I used grated carrots instead of cooked; and I replaced the granulated sugar with brown sugar (I also decreased the total amount of sugar). I was not disappointed with the results. The next time I make this recipe, I will probably replace some of the all purpose flour with whole wheat flour. 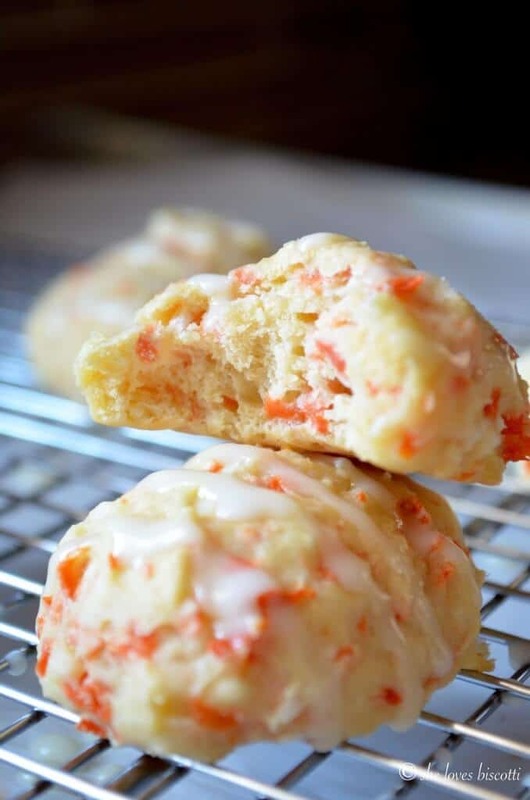 This recipe for these Glazed Yogurt Carrot Cookies incorporates coconut and carrots. A weird combination, but you know what? It makes for a terrific carrot cookie! 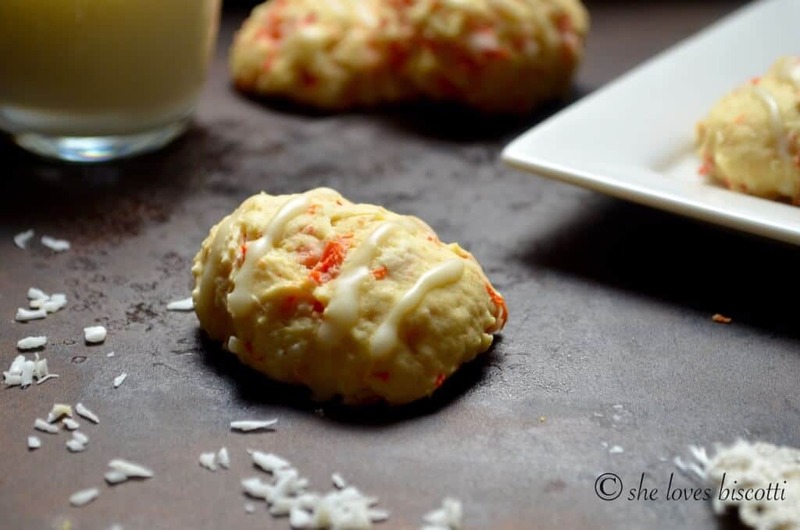 This recipe for these glazed carrot yogurt cookies incorporates coconut and carrots. A weird combination, but you know what? It makes for a terrific cookie! Sift together flour, baking powder and salt in a medium bowl. Set aside. In a large mixing bowl (of stand mixer), with whisk attachment on high speed, beat the butter with the sugar until light colored. (3-4 minutes) (can also use hand held mixer). Add egg and mix well. Make sure to scrape down the sides of the bowl. Add yogurt, applesauce and vanilla. Combine thoroughly. With mixer on low speed, add the flour mixture. Mix until just combined. Gently combine carrots and coconut. Cool on baking sheet for a couple of minutes before transferring to wire racks to cool. If desired cookies can be glazed. Whisk together 1/3 cup icing sugar with 1-1/2 - 2 teaspoons of orange juice. Glaze will be slightly runny. Can be adjusted to your own preference. 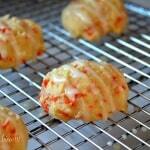 If you desire more glaze per cookie, recipe can easily be doubled. I make a carrot cookie with lentils and cream cheese frosting. Carrot cookies seem to be carrot cakes little sister and really are so delicious! Will have to try your recipe too! What pretty cookies! I like the adjustments you’ve made. Tropical cookies do indeed sound wonderful right now! Whaaaaaaaaaaat?! I need these in my life. They are so cute. The color just looks so happy and bright. I’m putting these on my Easter treats list. Thank you for sharing! These are such adorable cookies! 👍 I like idea of using the raw carrots too. Smart swaps! Love that this cookie is yummy and nutritious! Love the look of this cookie. It does sound tropical and light enough that I could eat a ‘few’ without guilt. Impressed with the changes you made to reduce the fat. Thanks.